The incident site in Moorebank. Eight workers were removing an asbestos roof and stacking the asbestos sheets on the existing roof. The condition of the timber roof structure was unable to support the weight of the stacked sheets. Part of the roof collapsed and two workers fell with the asbestos sheets to the concrete floor below. The fall was approximately four metres. 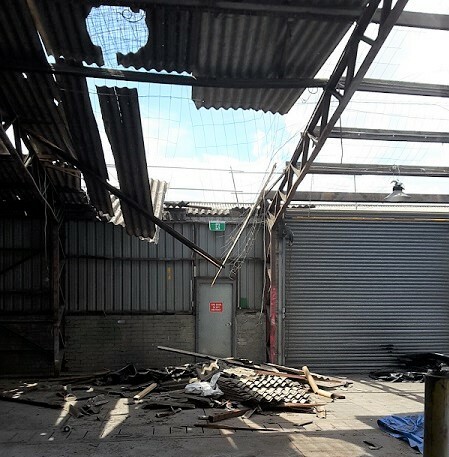 The workers were not wearing any safety harnesses at the time of the incident, however there was temporary roof edge protection and roof safety mesh in place. Activities undertaken at the site include asbestos removal work. When working on existing structures, such as during refurbishment, renovation or demolition work, a competent person should asses the integrity of the structure and determine whether it is strong enough to support the weight of workers and materials, and, will remain stable during the work. Additional propping or bracing may be required, and roofing material may need to be to be lowered as they are removed rather than stacked on the roof. Work should be conducted from the ground or a solid construction such as an elevated work platform (EWP) or scaffolding. Where work at a height is required, a safe means of access and adequate fall protection must be provided. Any existing permanently installed fall protection devices such as roof safety mesh, fall arrest anchorages and similar controls should be assessed before use to ensure they have been installed correctly and have not deteriorated over time. Where harness-based fall arrest is to be used a rescue plan must be developed and tested to ensure it is effective.